Rumor has it there are women out there who go through their monthly cycle with little to no issues. No mood swings, cravings, bloating or other symptoms of PMS. No cramps, tender breasts or break outs. Their flow is light and short- just a blip of an inconvenience in their month rather than a devastating time that has you literally down for the count. While these menstrual unicorns do exist, I have yet to meet a woman who has NEVER had at least some of these frustrations in her monthly cycle. Issues with hormone balance are likely the culprit in your menstrual woes and getting to the root cause [think diet, stress, digestion, inflammation and liver health] can be literally life-changing for many women. While addressing these issues is the cornerstone to happy hormones [and ultimately a much happier you] some powerful “food as medicine” options can help you tame these nasty symptoms. Instead of your medicine cabinet, try turning to your kitchen pantry [or fridge] for some of my favorite nutrients and functional foods when it comes to PMS. Numerous studies have demonstrated the benefits of vitamin B6 on premenstrual symptoms. The exact mechanism of how it works is not yet clearly defined, but researchers believe it may be due in part to its vital role in “happy” neurotransmitter synthesis, such as serotonin and dopamine. B6 also can play a role in decreasing cramping and menstrual pain because it is essential in the synthesis of prostaglandins [key players in your menstrual cycle]. Low levels of vitamin D have been linked to a number of health concerns including PMS. Like vitamin B6, we are not sure its exact link to PMS but its role in calcium homeostasis seems to be where researchers are looking and believe they will find the connection. Adequate vitamin D, in conjunction with calcium, is needed to fully reap its beneficial impact on your cycle. Not just for strong bones, calcium is also a key player in your PMS symptoms. In fact, studies have demonstrated that calcium supplementation can be just as effective as oral contraceptives (the pill) in managing symptoms of mild to moderate PMS. Evidence indicates that excessive PMS may actually be a symptom of a calcium deficiency that becomes “unmasked” as estrogen levels change throughout the menstrual cycle. The use of magnesium is currently being studied as a protentional treatment for PMS, menstrual migraines, severe menstrual cramping (dysmenorrhea) and symptoms of menopause. Subclinical magnesium deficiency is a growing concern due to poor diet and poor soil quality which results in reduced levels of magnesium in our crops and menstrual issues may be one such sign of a deficiency. 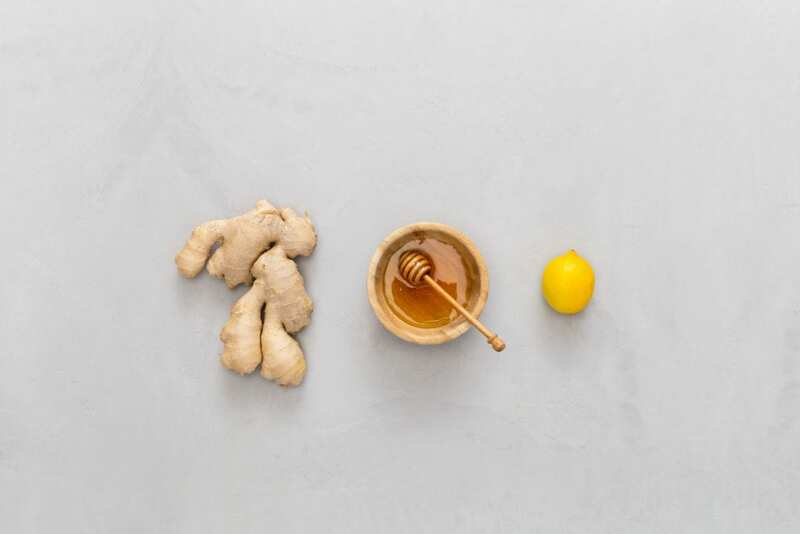 When we think of the healing powers of ginger we usually think of it as a tummy tamer; however, ginger’s role in managing PMS may have you expanding your use of this root. Ginger has potent anti-inflammatory properties and can be used as a mild pain reliver. So how much ginger do you need to take in order to feel its effects? One study found that an eighth of a teaspoon, four times a day, for three day during menstruation had a similar effect at reliving menstrual cramps as ibuprofen! Another study found that drinking ginger tea reduced PMS symptoms significantly as comparted to both mint tea and a placebo. These days turmeric seems to be leading the way as the latest superfood. It’s powerful medicinal properties are due to compounds called curcuminoids. From reducing inflammation to preventing cancer, the benefits of this spice seem limitless. It should come as no surprise that it has been used to manage the symptoms of PMS, painful menstruation, and menapusal symptoms as well. While turmeric teas and lattes can be a great was to add curcumin to your diet, turmeric is a great spice to add to veggies, rice, soups and smoothies too. Some women CRAVE chocolate during their period and maybe this food can be seen like more than of an indulgence. However, not only is dark chocolate an excellent source of PMS minimizing magnesium but its powerful flavonoids also act to quell inflammation. In fact a recent study of 40 university aged women with dysmenorrhea [painful periods] found a significant decrease in menstrual pain as compared to the placebo. High in healthy omega-3 fatty acids, flaxseeds should already be a pantry staple in your house. If they aren’t, perhaps this news will sway you. Adding flaxseed to your diet may be a great way to help with painful breasts that occur with your menstrual cycle. In addition to the beneficial fats, flax has lignans which act as phytoestrogens [normalizing estrogen metabolism]. Due to their mild estrogenic effects flax seeds are a great addition to your diet for the first half of your menstrual cycle (the follicular phase). 1 tablespoon of ground flax is enough! Amelia, R., & Maharani, S. I. (2017). EFFECTIVENESS OF DARK CHOCOLATE AND GINGER ON PAIN REDUCTION SCALE IN ADOLESCENT DYSMENORHEA. JURNAL KEBIDANAN, 6(12), 73–81. Ebrahimi, E., Khayati Motlagh, S., Nemati, S., & Tavakoli, Z. (2012). Effects of Magnesium and Vitamin B6 on the Severity of Premenstrual Syndrome Symptoms. Journal of Caring Sciences, 1(4), 183–189. Jensen, D. V., Andersen, K. B., & Wagner, G. (1987). Prostaglandins in the menstrual cycle of women. A review. Danish Medical Bulletin, 34(3), 178–182. Parazzini, F., Martino, M. D., & Pellegrino, P. (2017). Magnesium in the gynecological practice: a literature review. Magnesium Research, 30(1), 1–7. Rohit, D., & Tiwari, A. (2018). Effect of Ginger Tea on Dysmenorrhoea among Adolescent Girls-A Literature Review. International Journal of Nursing Education, 10(2), 20–23. Samieipoor, S., Kiani, F., Sayehmiri, K., Sayehmiri, F., Naghdi, N., Ghafari, M., … Bahmani, M. (2016). Effects of vitamin B6 on premenstrual syndrome: A systematic review and meta-Analysis. Journal of Chemical and Pharmaceutical Sciences, 9, 1346–1353. Wyatt, K. M., Dimmock, P. W., Jones, P. W., & Shaughn O’Brien, P. M. (1999). Efficacy of vitamin B-6 in the treatment of premenstrual syndrome: systematic review. BMJ : British Medical Journal, 318(7195), 1375–1381.